The 60-foot Sept. 11 memorial flag flew during Attleboro’s Fourth of July fireworks show. The flag is dedicated to the memory of those who lost their lives on Sept. 11. A nonprofit, all-volunteer group has been traveling around the United States since last September with the goal of stopping in each of the 50 states in 50 weeks leading up to the 10-year anniversary of the infamous day. Material (the flag remnant cut off when the flag was repaired) will also be on the tour with The Patriot Flag. This 4 X 20.5 foot piece of the flag was saved when the flag was repaired. 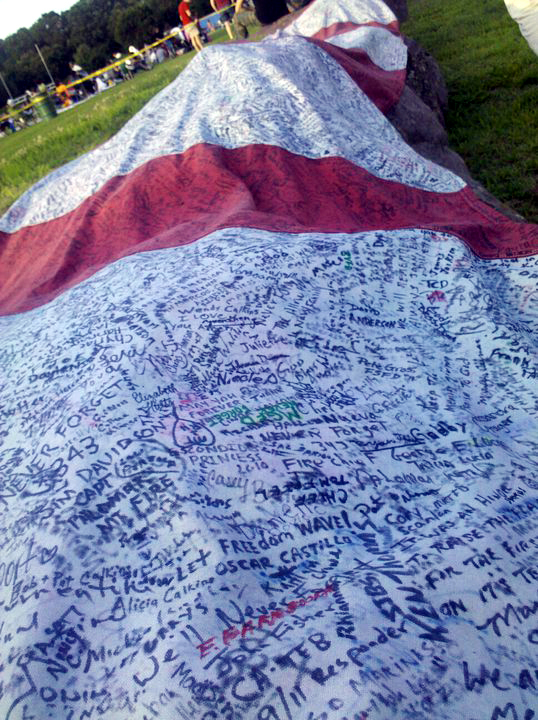 Historic Patriot Flag signed from across America.